The word Modern comes from the root Latin word ‘modernus’ which is from the word ‘modo’ meaning just now. The oxford dictionary defines ‘development’ as ‘a new stage in a changing situation’ therefore to me this dialogue on education, modernity and development is about the system of education as it exists now and its direction in the time to come . No doubt historical perspectives are good tools to examine change, but we must take care lest they resist ideas from taking charge. History of science tells us that adaptation to its environment precedes evolution of species . This biological reality is noticed in every action of the survival of human beings. Naturally with evolution a change in systems too is an inevitable reality. Adaptation would follow and in a social context this happens by learning from experience. If the beginnings of education were a spiritual quest for some and a vocational one for others, it was because the system in place then demanded it; it also took care of the needs of everyone. Like evolution of life on earth, as the societies evolved so did the systems, which evolved and changed. Without dwelling on the history of these events, I restrict myself to say that the adaptation acquired new perspectives. Anything that moved from the old to a new was modern and the processes for emergence of modernity was development. Slowly but steadily the spiritual and vocational that co-existed underwent transformation, the latter taking precedence over the former. We have thus come to a stage when we are wondering how these two can have an equal presence. It is not as if we have lost the spiritual aspect of learning; it is there in the unconscious deep in some slumber or so it seems, the chances of awakening appearing remote. Why? The increase in population of human species is a fact that we have to look at realistically. The resources available for sustenance is fast dwindling in the face of consumption. This in turn is making competition fierce. It seems of all the events from history, competition akin to war has come to be the most accepted model for vocational quest. Running parallel and contributing to this fall in spirituality is the phenomenal rise of science as an answer to all difficulties. The unbridled satiation of curiosity as the basis of scientific advancements is a further statement of the increased absence of spirituality. For in the search for the unknown self discipline is necessary; but self-discipline is increasingly absent because it is the resultant expression of spirituality! Of course these statements are open to widespread criticism as they are made without any empirical proof. Given this situation, what should we be doing at schools? There is a general idea that with so much information and tutorials available on the world wide web, schools as they exist now may become redundant soon. I live in a village and looking at the situation that exists, I am certain that they are likely to be around for the next 25 years at least if not more. Their character might change, but they will not become non-existent. So what can we do given the present situation? It is an indisputable fact that teachers hold the key to a learning situation. What can a teacher do in the present system? From the parents it is that their children score good marks. It is not that scoring high marks be seen as a negative expectation; when it reaches a stage such as it is presently eclipsing real talent it becomes a cause for concern. Unfortunately very few parents’ expectations are that their children learn, they want to see big numbers which they think are the signs of learning. The school authorities generally like their teachers to be jack of all trades. For schools it is more important that a teacher enhances their reputation as one producing good results through high scores than merely one who educates. They also expect teachers to meet the requirements of school without expectations of adequate time or remuneration for their efforts. The school boards expect that a teacher is periodically trained in emerging technologies and viewpoints of the society, in the periodically revised curricula and in the new curricula /subjects introduced by them in the shortest, briefest time possible. The introduction of environmental education in schools without any planning, training or assistance as the first step is a classical example of this. The government on its part formulates policies, programmes etc to be executed in the classroom. This they do officially on paper using all the right words and with focus ; In practical implementation it is without adequate measures to ensure the dissemination of these policies to teachers or accountability for their execution. These are only some of the expectations and yet bring to attention the difficulties under which a teacher operates to make learning a meaningful experience. Yet teachers deliver. If one asked an experienced teacher how they did it, the answer would lie in the teachers’ selective choices of curriculum transaction in class. Those who have succeeded are teachers who have not let their common sense be subsumed by the expectations of the stakeholders; who have found support for their initiatives from their institutions; who have not sacrificed learning at the altar of competitions and examinations. Therefore if these teachers are not involved then development in the field of education will only be a cosmetic one . But if development is seen as a process that could result in a paradigm shift then change is possible. When , as documented in the NCF 2005, a large population is without access to formal or informal education, how much can these periodic processes achieve? Despite some excellent statements of intent regarding perspectives, content, transaction and expected outcomes what is different in the new curriculum that was subsequently designed? (by NCERT) It is just tinkering here and there with a broader statement of methodology and assessment. Words used in the documents of NCF2005 have no connection if for eg you try to relate it with the design of the Science or Environment education syllabus. Has this process tried to address the problems that a teacher faces everyday in the classrooms? Or is it beyond the purview of such an exercise? Can the syllabus suggested by NCERT really help to bring that large deprived population into the school system? There are no teachers even in many of the schools that exist! I am tempted to ask, if there are three fourths of population that need to be educated what can this model achieve when it is not much different from earlier ones! Isn’t there something that need to be done differently ? If something different has to happen in education, it can only when a teacher puts her/his mind to it. And therefore it is my suggestion that reform , model, development give it any name you like, but if change from the present system has to occur then the process must begin with the level of teachers. An urge to keep boredom away and welcome cheer. This cultivates an interesting personality. So even if the topic in class is a boring one, the teacher is not willing to get bored . Enthusiasm gets shared with her students. Basically in any issue if one is interested so will others too. A continuous interest to learn. Teachers who have learnt from every situation have made a success of their career and have influenced their students. A learner is a teacher, which is why peer learning in schools is more successful than learning from adults. Pragmatism. A teacher needs to function with tremendous amount of common sense and able ones know how this is the best aid during difficult situations. Think with clarity. The ability to think through a situation or a topic is of essence for a teacher. This is an area that teachers need to be helped with. Adaptability is another important feature seen with successful teachers. They find ways and means of working around difficult situations to ease matters for their students. Flexible and democratic authority. Such teachers use authority flexibly and in a democratic manner. Learning to use affection and authority in a judicious mix, they are not averse to apologizing if there is an error on their part. Students even those who rebel, can be calmed if there is evidence of fair-play. Learning is fun. I do not mean in the way this statement is generally made. I mean that to experience a sense of merriment, humour ,laughter and even the absurd can be a great relief for older children. It often is a factor that aids in bonding with them. I notice that this is a tool decreasingly used these days. Have their own value system. We speak of value education today. Values practiced by teachers are infectious. Values are better learnt through non-formal communication. Dedicated teachers have also not allowed examination systems to interfere too much; even under the most difficult circumstances they have managed to keep students interested and focused and have tried to instill some things larger than the narrow domains of marks and exams. Acceptance of one’s shortcomings and the ability to work is a quality many students have said they liked in their teachers. Certain degree of mastery of the subjects they teach and the ability to communicate it in simple and clear language is finally an important asset. This list leaves out several more factors. But examine these factors carefully and it is clear that a positive attitude is the defining quality of an able teacher. How do we get teachers with a positive attitude? What can be done to bring back a culture of learning ? I believe we must begin from the base, with the teachers. Processes such as NCF 2005 are examples of top down model. In every profession be it education, health or industry, it is being increasingly accepted that a top heavy model does not always help to meet the desired goals. Yet all educational reforms have been top down model. The first step to a meaningful reform is to place along with the top-down model other models of reform and work from two different ends. I am tempted to say that the top heavy centralized model be replaced with a bottoms-up approach or a decentralized model. But in a large country like ours with so much of pluralism in its structure and culture that might well lead to anarchy in education. Hence a right mix of the two would be an exercise worth undertaking. The top-down model does not need explaining so I shall highlight what I visualize as a bottoms-up approach. No process can bring about change unless there is involvement of all the stakeholders in one form or other. Native intelligence of the teacher at the lowest rung (of the current education model) is a relevant and essential input as are those from a professor in education. Process of reform without a widespread debate across the country before its introduction will not be effective. Reform process in education must move away from focusing on content to attitudes and skills. The most important change should be on the nature of assessment which needs to undergo not just an antibiotic treatment but a major surgery. Assessment at the end of a ten year learning process would be more on abilities, cognitive skills, attitudes and less on content. The decentralized model advocates that a curriculum design begin at the school level through deliberations between teachers, teacher educators and curriculum consultants. The curriculum’s focus would be on developing cognitive skills and attitudes in learners. The content that is the main and the only menu of all curriculum dealings today, will be reduced , less bulky and suitably designed for realizing the learning outcomes. Therefore major emphasis of the learning process, classroom transactions would be towards the mastery of skills and development of attitudes with knowledge of content as a minor component. Curriculum design’s focus would be on the processes needed to mould students into learners and not on the enormous amount of information a child is expected to remember in every class. It would look to reduce the number of subjects learnt at each level. It would attempt integration of concepts/subjects meaningfully and not superficially. It would also examine an entirely new approach to assessment. The biggest obstacle to this process will be the opposition to reduction in content and subjects and a new evaluation system that would have to be instituted. To invite participation of schools from all over the country and conduct country wide seminar, debate and discussion to decide the degrees & extent of skill & attitudes to be attained at each level of school education. Schools would be responsible for the content to be taught such that the required levels of skills and attitudes are achieved. They will be as involved in final evaluation of the child in class 10 as would the central evaluation authority. What are the advantages of shifting focus from content to skills and attitudes? It shifts the focus from information to processes: Learning is a process. If my language abilities are poor and I cannot read and write well, of what use is all the content? To give you an example- Instead of listing the numerous causes of pollution of water or air if one is involved in actually finding out how one uses water, where it comes from and where it goes – will a student not learn about the pollutants, the cause and the effect through the process of discovery? Beginning with the list of water pollutants is teaching conclusions. Isn’t education about the process of learning to infer, to come to a conclusion? Can the focus of environment education not shift from information to process ? Subjects such as environment education, peace education, citizenship education are about developing attitudes and yet the emphasis is on content and not on process. It could be an answer to empowering students from various deprived classes: When focus shifts to processes, some of the advantages that economically upward classes, urban students have over others is removed, opportunities for learning becomes the same irrespective of your location or economic/social status. One of the factors that strike you when you meet with rural students is their originality of spark and sharpness of perception. Once cognitive skills find importance over information far removed from a student’s experience, then there is no special advantage for any one group over others. This could be an answer to the tricky issue of reservation; empowering backward classes. It could bring about a better understanding of the process of education for a teacher: Currently a teacher is caught up in the whirlpool of something learnt in a B.Ed course, some other things expected by the school, and a new situation everyday within a classroom. These are quite unrelated and to adjust to them takes time- the one factor a teacher never gets. But what happens ultimately in class is governed by what the teacher had as a model during her school days. The new design could avoid such confusions. With the teachers involved in the process of curriculum design, there would be some understanding of what needs to be done. Such a process would also help clarify many terms such as comprehension, thinking, understanding, knowledge etc so often used in schools. It would permit a child to reclaim his/her childhood which currently lies buried under the mountain of information to be learnt in school. Normal growing up processes have come to acquire educational terms. So we have play-way method. Why play-way? Let the child play when he/she has to play. Playing and growing up has now become playing and learning and neither is achieved to satisfaction. If something is interesting a child will learn it ! By reducing content and highlighting cognitive skills, we would allow space for the curious mind to explore, which is a hallmark of childhood. It could address the problem of drop outs and make education more accessible: There are several dedicated people working with children from economically deprived classes, working with those who have no access to schools etc. These groups could actually derive advantage from such a model and bring up children to the same level as their upwardly mobile urban counterparts. It would give the much needed respectability to systems such as National Open schooling, removing certain stigmas associated with distance learning programmes. It would provide time : Time to play, to learn, to engage in hobbies, to spend time with family – all so vital in the making of a healthy society is possible if the focus of learning shifts to processes. There is no claim that a different model is going to suddenly change the face of education. But we need change and in such a large country as ours, commands emanating from the country’s capital cannot be the answer. History tells us that grassroot movements are the ones that augurs change. In education the grassroot level is represented by teachers in schools. 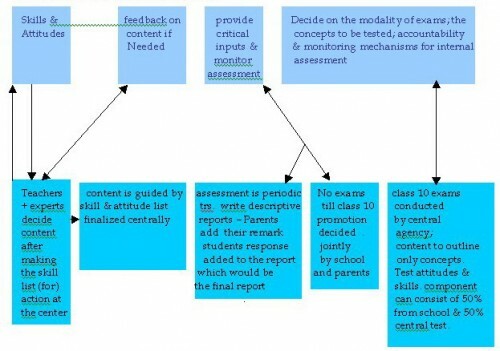 A clear and graded road map for learning outcome be prepared. The learning outcomes will highlight the cognitive skills that a child can be expected to acquire during the 10 years of education. For eg. at the end of elementary school years it could be primarily mastery over language and mathematics related skills. In the middle school years it could be process skills associated with the ability to think such as observation, reasoning, graded and different forms of writing in addition to the next level of language and mathematical skills. At the high school level the ability to analyse, work independently, experiment and solve problems etc. etc. This process starts at decentralized levels in schools : By initiating this process one is getting a teacher to be involved. This will surely raise the all important question as to why we are teaching something at a particular class. If teachers from schools are asked to be part of a process of preparing a list of learning outcomes based on their experience, then the workshops or meetings they attend will have a purpose; will allow them to think about what they are doing in class, will set in a culture were teachers may also enjoy learning and teaching. A country wide debate on the learning outcomes: This process should be like the process of electing members of parliament. Debates at the levels of panchayat, towns, cities and states; schools, colleges and universities; and finally a national debate. With a visual media hungry for news and wasting time broadcasting the same matter umpteen times, there is an excellent aid to make this as inclusive as one would wish to . The design of the evaluation process : This is the difficult part of the enterprise and would require deliberations again across the country. As slowly as marks are getting replace by grades, this process must be enhanced so that exams are abolished altogether till class 10. Instead a system for reporting attitudes and skills must be evolved. Periodic reporting of development in this area is necessary. The report should have a segment where parents are also putting down remarks and a student’s response to these are documented. The movement of a student from one class to the next must be taken with a discussion of this entire report and not based on annual examination. Place of examination : At the end of class 10 a student can be asked to take an examination where again the emphasis would be on attitudes and skills; content would brief and could be decided by the central authority. Conclusion : Development that is significant is always marked by bold and new approaches. A statement oft repeated in today’s educational circles is about getting people to think out of the box. This recommendation is applicable today more to those involved in educational reforms than any other group. I conclude with a piece that was sent to me by a friend. Its authorship is unknown and I do not even know how original it is; but it has something significant to chew about for all teachers and people involved with education and children.